AmpliFIRE 6 is latest addition to Atomic’s AmpliFIRE line and redefines the performance to size paradigm in guitar processing, while at the same time being an exceptional value. 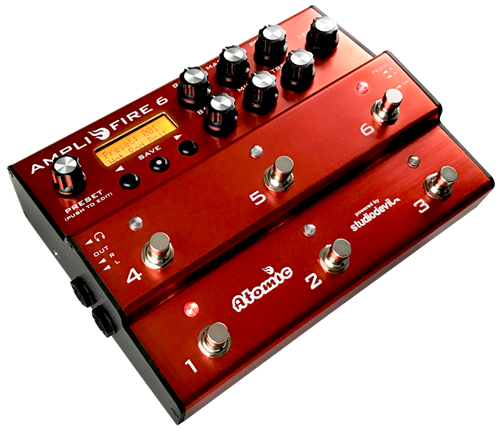 AmpliFIRE 6 merges the best of our original AmpliFIRE and AmpliFIRE 12 products with an even smaller footprint! Small enough to fit in the front pocket of a gig bag yet potent enough to please even the most discriminating tube amp purists and effects aficionados. Armed with world-class, patented amp modeling technology and the ability to load 3rd party speaker impulses it can faithfully recreate the experience of playing through the greatest guitar amps of all-time. AmpliFIRE 6 is equally capable of being a complete rig replacement or part of a larger pedal board and/or outboard processing rig. All new, state-of-the-art amp modeling based on Studio Devil’s highly acclaimed and patented technology! Robust effects selection including drive, modulation, delay, reverb, eq, gate and more! Download editor software. Latest firmware built in. RESTORE YOUR AMPLIFIRE BACK TO FACTORY SPECS! © 2019 Atomic Amplifiers. All Rights Reserved.